My kids are just about the least picky eaters I know. Sometimes they declare flat out that they don’t like a food, but they’ll still try it when I encourage them to. Just the other night we went to a friend’s house for dinner. She’s Taiwanese. My kids ate intestine, oysters, Peking Duck, and even piled their plates high with vegetables. I don’t sneak vegetables into their foods. Instead, I try to make them taste good. There’s nothing like green beans pan-seared in bacon grease, sweet potatoes fried in tallow, or a squash casserole cooked up with melted cheese and diced green chiles. 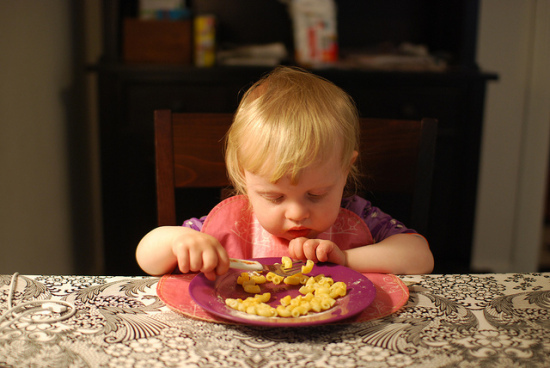 But what do you do when you do have a picky eater? A child who will only eat hot dogs, pizza, mac-n-cheese and dessert? I know of many moms who have tried to sneak vegetables into their family’s meals. They swear you can’t taste them. Some things seem quite natural, like pureeing the aromatics you might otherwise have simply diced and put into a marinara sauce. But what about hiding spinach in brownies? That’s what two cookbooks I recently discovered are all about — how to sneak vegetables into your family’s favorite foods. 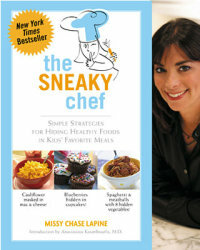 Weighing in at 272 pages and offered for a mere $12.25, The Sneaky Chef has loads of easy, kid-friendly recipes. And thankfully, the author doesn’t shy away from nutrient-dense fats like whole milk and butter. (You’d be surprised how many so-called nutrition experts advise a low-fat diet for growing children! This, when they’re growing fat-dependent brains and nervous systems.) Granted, she’s not distinguishing between the butter from grass-fed cows and regular, industrial butter, but you know enough not to be bothered by that. You’ll simply pile on the real butter and be glad she’s not asking you to use margarine! The downside, of course, is that she’s a believer in conventional nutritional wisdom. So, refined or improperly prepared grains, refined sugar, and many other unhealthy modern foods make their way into the recipes. If you want to use the recipes, you’ll definitely be adapting them. I personally tried the Macaroni & Cheese made with hidden cauliflower and zucchini. Of course, I adapted it to use brown rice pasta (the most innocuous store bought pasta I can find) and dairy from grass-fed cows. And I added real sea salt because I didn’t find the original recipe flavorful enough. But you know what? That sauce (made by incorporating a vegetable puree into it) was creamy and tasty. 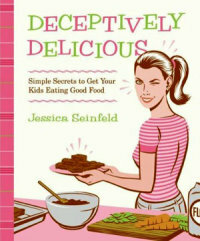 Written by Jerry Seinfeld’s wife, this book has been featured on Oprah. Because of it’s popularity, Deceptively Delicious is now down to just $6.13. The pluses to this book? It’s spiral-bound, as any good recipe book should be. It has more photos and illustrations, too. The recipes, though, aren’t nearly as smart. It mixes odd textures into foods where they shouldn’t be. The Macaroni and Cheese in this book, for example, actually tries to hide beans! They’re simply far too starchy to be “hidden” in a cream sauce. Plus, as with The Sneaky Chef, what passes for “nutritious” is just abhorrent. I’m sure you’d all agree that it’s far better for your kids to learn to like real, healthy food than it is to disguise it. Many parents adopt a sneaky way of cooking while trying to get their kids to broaden their picky palates. They’ll serve tasty vegetable side dishes right alongside hidden vegetables, hoping that one day their kids will like the obvious and the hidden will no longer be necessary. There’s another school of thought that says we really shouldn’t care about getting our kids to eat vegetables at all. After all, while they’re young and growing it’s more important to get nutrient-dense foods into them — egg yolks from pastured hens, organ meats, mollusks, butter from grass-fed cows and other healthy saturated fats, homemade bone broths, and naturally-fermented foods like sauerkraut and yogurt. So, they say, offer tasty vegetable sides, but don’t worry if your kids won’t eat them. Which school of thought do you subscribe to? How do you get your kids to try new foods? Nope, no sneaking here,either. I do have one kid going thru a picky stage right now but normally, they like trying new foods. I firmly believe that children raised taking part in the growing of their food are more likely to eat it. If they see it grown from seed to harvest and have a hand in each step in the process, including cooking, they’re more likely to eat it. Also, I think introducing different foods and textures right from the beginning of their relationship with food in babyhood helps kids have more adventurous taste buds. I do agree. I don’t want to have to trick my kids into eating good food. If you hide it, how will they ever learn to love food for what it is and how to make healthy food choices on their own? All good points. My kids have now helped plant 3 gardens, but they’ve never seen any of them bear veggies/fruits. (Mostly because of moves.) I would *love* for them to get the complete experience from planting seeds to eating it at the table. I sneak vegetables into my husband’s food, but not my 16 month old. If he sees me eating it he will try it. If he tries it often enough he decides he likes it. Honestly, at this point I simply make nutrient dense meals with tasty vegetable sides, put it in front of him and let him eat as much or as little as he pleases. At less then a year and a half old he has a broader palette than his 31 year old father. The only downside is that not only will he eat organ meats and other super healthy foods, but also the food-like chemical garbage his grandparents give him as treats. Although his taste for the “treats” is much more limited than his taste for the good stuff. I sneak veggies. Or well, I used to. The Sneaky Chef was my guide to getting my picky kids to eat vegetables. By increasing, gradually, the amount of veggies in heir favorite foods, it seemed to get their palates used to them and later they ate them on their own. See, I’m glad to hear it worked for you. Maybe that will give some other parents hope! But no, I don’t use recipes that legitimately try to “sneak” veggies into them without the recipient knowing. I think that children need to learn what veggies look like and taste like to appreciate them. And, at the age of three right now, my oldest will eat almost anything as long as it’s dunked into ranch dressing (which I make from scratch of course to add some extra probiotics!). And, anything cooked with adequate butter, cheese, cream, bacon grease and garlic and olive oil is always a hit at my house! I think that, being organic gardeners, my kids have grown to love veggies just by being a part of the process, and I’ve encouraged them to taste and smell and touch what we grow and buy, and get excited about it! Great post! Looking forward to reading future comments! I think besides making veggies taste good (with plenty of butter, bacon grease, etc. ), the best thing we can do is welcome our kids into the kitchen so they can help cook. They’re always so much more enthusiastic about eating foods they helped make. I don’t sneak veggies into my kids. I think the nutritional value of vegetables is grossly overrated (most cultures Weston A Price visited ate only a small amount of vegetables, usually in the summertime). That said, my kids do eat some vegetables without question, especially if part of a stew or casserole. Or cooked in butter–but who would refuse that? Ha! I just got hold of meat grinder, so I will officially be trying to sneak organ meats into our meals, too. Thankfully, we all like liver and eat it (in the form of Braunsweiger) about 2-3 times per week in our lunches or snacks. But I still feel like I want us to eat MORE! It seems like it’d be awesome to know that my ground beef dishes were that much more nutrient-dense because there was ground heart or liver hiding in there. No sneaking here. Aside from being dishonest, I think hiding veggies teaches kids that vegetables are something to be endured instead of enjoyed. And that’s not cool. Thanks for sharing the link, Christina! I bet a lot of parents will find that discussion helpful. I don’t really sneak. As I’ve been eating more and more quality vegetables that I prepare with intent instead of a last minute addition to make what I prepared a ‘meal’ I’ve been enjoying them more. I no really miss a good vegetable (or a couple) at meals. I’m more worried about developing taste buds then ‘sneaking’. So far my kids aren’t too picky and while I do put extra veggies in a lot of my casseroles, I’m not really sneaky about it. I also serve a lot of veggies on their own (well usually with lots of butter and spices) and make my boys try a “polite bite” every time, but then hubby and I just try to set a good example by eating and enjoying them ourselves. Usually the boys ask for multiple servings. I do put liver into any dishes with ground meat, but mostly to try to hide it from myself. I wish someone could sneak it in for me. No one else in my family can taste it, even when I tell them. But I can taste it and dislike it, I think because I’m the one putting it in there. I don’t have kids yet, but I still love reading discussions like this because I plan to have children in the future. Just wanted to write a comment to thank you for another thoughtful post! I’ll only add that like the Sarah above, I tend to put vegetables into most things anyway. Does soup count as hiding? I do toss random veggies into the soup pot and puree it into creamy goodness, but usually I simply put them on the child’s plate and inform her that this is dinner, take it or leave it. I try to sneak them in when I can. My child is almost recovered from autism but still has that stereotypical pickiness that many of them have (but is very improved from his past). But all is not lost. Since we are on the SCD (much like GAPS) there is no junk in his diet. He enjoys SCD cookies and such but does not have the sweet tooth that most do. He likes his cupcakes without frosting (muffins are a great way to sneak in some carrots). 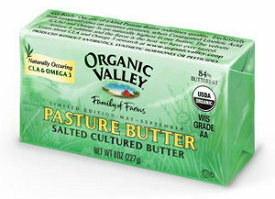 He loves egg yolks, fish, chicken, beef and “butter cheese” which is grass fed butter with sea salt and pepper on it. He loves to taste spices, having us put tumeric, coriander, paprika, etc on his hand to lick. Sure, I wish I could get him to eat veggies and yes I have to sneak them in, but I am glad he happily eats many other healthy foods. One of my boys is also a spice-eater. He’ll pour just about any spice in his hand and lick it up. I used to wonder if it represented some sort of nutritional deficiency. Now I just think it’s because he loves the bold tastes. No sneaky here, but I’m blessed with a child who doesn’t mind (and sometimes prefers) the veggies! Both, if that paradox is possible. Give ’em as nutritionally-dense foods as possible (whatever you can gets your hands/budget on) and provide as many lovely vegetables alongside that. It seems to be all about “what they’re used to” and training the palate. My oldest, who turns 4 in a few days, is an excellent eater. My just-turned-two-year-old is the pickiest eater I have ever seen. He was recently weaned. He had all solid foods pureed as an infant — none of that jarred stuff. The little sweetheart will not touch meat, not even homemade chicken nuggets. The list of what he wants to eat is very short. We are a whole foods, grain soaking family and I am beside myself in getting him to eat anything that is nutritionally dense. He is always presented with what we are eating and NO alternatives are given. I’d love to hear thoughts on how to handle this. I am tempted to give him a tasty homemade shake once a day packed with nutrients to ease my mind, but I am not sure if it is the right thing to do. I don’t want to exasperate the meal-time problem. Will he grow out of this? Is it just a willful 2-year-old problem? I know no one is going to fix my sweet boy’s picky-ness, but I would love to hear some thoughts. It might be a texture issue, if he started on purees. I’ve heard baby-led weaning helps babies not get so picky. Meanwhile you could try purees or shakes; I don’t think that will do any harm, and it’s likely to help if texture is the issue. On the other hand, two is a pretty picky age. In a year or two, he’ll probably be much easier. Why yes! Yes, I DO sneak veggies. My immersion blender is wonderful for this. Just tonight I made a casserole from turkey, corn tortillas, and cheese. The sauce/filling was made with sauteed onions, green bell peppers, tomatillos, tomatoes, garlic, and cilantro. I blended all the cooked veggies with a bit of chicken broth. My kids happily ate it. I think it’s a texture thing for them, not so much taste. I am very happy that you posted this. I struggle to get my kids to eat at all. For all my efforts to serve whole unprocessed and real foods, I send them to bed hungry many a night. Even when I do everything right I just can’t get them to eat as well as I would like. Even though I know they would eat crap if I gave them crap, I don’t do it. But it is hard not to get the impression that I am a lousy cook, or that I have made some fatal parenting flaw so that I am somehow at fault for their poor eating habits. I liked reading your post because I feel a little less guilty about my attempts to sneak in veggies. And also a little better about knowing that if they are only eating their grass fed beef, that at least they are getting what is most important for them. I do love the vegetable-in-the-smoothie trick. I usually add greens, which my daughter will not touch in any other form. Also, beets make a pretty smoothie. I will admit that I feel better on days that she has a good smoothie for breakfast. Sort of let’s me off the hook. In one category, at least. When we have vegetables they are either cooked in butter and seasoned or raw in a delicious salad with homemade dressing or dipped in homemade ranch or some other yummy dip. So my kids don’t really refuse them much at all. 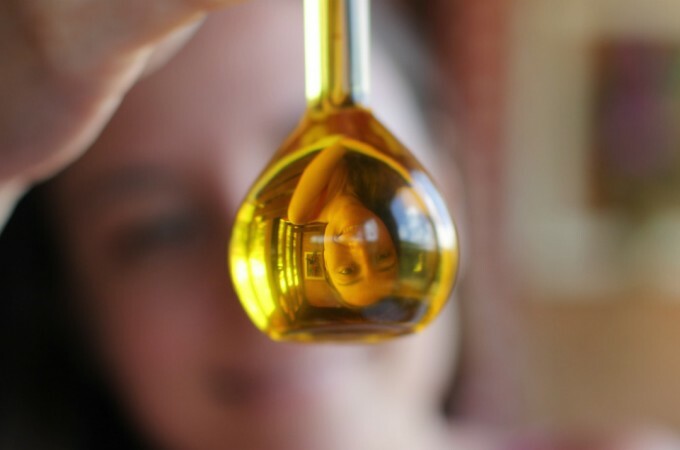 I really love “Sacred Appetite”‘s take on this…http://sacredappetite.wordpress.com/2010/09/03/when-healthy-kid-foods-poses-as-junk-food/ Wonderful, convincing articles all through that site….. Yes and no. I use a lot of fruit and veggie purée when baking. I always tell my children what they are eating (if they ask). They are not very picky though, they like veggies. I have Deceptively Delicious and liked it before I dove into whole foods. Now I look at it and think…wow…the recipes are adding tons of sugar to cover the hidden vegetables! I used to try to sneak vegetables, but I don’t anymore. I offer them to my 2 1/2 and 11 month old and sometimes they eat them, sometimes they don’t. I have noticed that since we are eating only whole, real foods now, my 2 1/2 year old has a wider palate and will try more foods. He seems to be less picky (but we have also eliminated allergens – gluten and corn – so he doesn’t self-limit to those allergenic foods anymore, which I’m sure helps). They always drink a green smoothie every day. It is 50% greens, 50% fruit + flax seed and coconut oil. I feel good that they’re getting that, so it makes me less stressed about whether or not they eat their vegetables at lunch or dinner. That has given me a lot of peace of mind, personally. Right now, my step-son and his girlfriend are living with us. His girlfriend picks through food and is a junk food junkie. In fact, she would rather eat at Taco Bell to avoid a meal of roasted chicken, mashed potatoes, gravy, green beans and a salad (weird, I know). BUT, if I announce that we are having chili or better yet, chili dogs – she is right there and ready. All this to say, I have never intentionally masked the vegetables in my food until now. I should say, until she got pregnant with my step-grandson. Now, I finely grate vegetables into everything I make. My chili has lots of celery, onion, tomatoes, zucchini, carrots, jalepenos in addition to grass-fed organic ground beef. Same is true for any of my pasta sauces. I never thought that I would be this way, but I figure I will continue. With my own kids, I will add vegetables on the side as well, but why not hide some too? Well, perhaps you’ll find the recipes in those books useful. I think we all have to start where we’re at. For your son’s girlfriend, that means you’ve got to hide those veggies where you can! I’m of the persuasion, though, that we shouldn’t keep the hidden veggies a secret. We hid them, let the people we’re serving enjoy a few bites, THEN let them in on it. The expression on their face when they’re eating (and ENJOYING) something with the dreaded veggies in it is priceless. And it also gets them thinking that maybe vegetables aren’t all bad after all. Oh, yeah, Sarah – I put the same finely grated vegetables in my meatloaf as I do my chili, minus the jalepeno. No one can tell the difference and it is nice and moist. Kids need to learn to eat vegetables while they’re young and I think it’s possible to get them used to veggies as long as they are started early on them. I never sneak vegetables in my kids’ food. I tell them they need veggies because it’s good for them. My mom on the other hand just made vegetables really tasty. She used to mash steamed squash and mix milk in it. That was an absolute favorite growing up. If you only have good food available then you won’t have a picky eater. Those who give their kids junk food and fast food breed that kind of behavior. Kind of like mum always allowed us to have a drink growing up; so when in high school all my friends were trying to get beer I was like it’s no big deal. If its not made a ‘forbidden’ thing it is no big deal. Did the same with both my girls. They remarked it was funny their friends would even pay homeless to get them beer! I always kept carrots, celery, etc as snacking food. When I had 15+ teenagers on weekends, being a single mum I would make homemade pizza’s. The kids LOVED it because they could add what they wanted and I used frozen bread dough! 5 large pizzas: $5 for dough plus another $5 for ingredients…$10 to feed 15+ teenagers, boys included! Key point: junk in make junkie people. Just like trying to sue MicyD’s. THEY didn’t make you buy their junk food! It’s a choice; period! My kids are both pretty good about eating vegetables. I dont hide them. But, I do believe in dressing them up. A pat of butter, the proper seasonings can go a long way in turning a vegetable they cant stand into one they dont mind, even if it never becomes a favorite. I don’t sneak veggies. My son (17 months) is going through a phase where there are several he doesn’t like. I don’t care. I serve them to him anyway (alongside pastured meats, sprouted bread and butter, homemade yogurt, etc.) and if he eats them, fine. If not, fine. I do put spinach in smoothies because, well, I happen to like them better that way. My daughter went through this same phase. She’s almost 3 now and she LIKES most veggies. She definitely will eat corn, potatoes, broccoli, carrots, beans, green beans, and I’m not sure what else. Typically whatever I serve, she’ll eat. She does not like “mixed” foods very much (like casseroles) so I can’t serve her veggies covered in cheese sauce — she won’t eat them. I just sneak a little butter onto them or serve alongside something containing fat, and call it good. I really think if you feed your kids nourishing foods, they will USUALLY eat their veggies. They will go through picky phases but they will never self-limit their diets to mac’n’cheese and hot dogs (both of which, in organic form, my daughter does like on occasion, but by no means is it daily!). Oh, and we also call white sugar and nasty “treats” ‘poison’ and talk about how they will make her tummy hurt. She has been able to tell us this for almost a year and will often choose not to eat those foods. No sneaking for me either. I don’t believe in it full stop (period). It’s one thing to make delicious purées, soups, fritters or bakes with vegetables that are minutely chopped, but disguise seems to be making a rod for your own back. Start as you mean to go on! There are a few ways that Finn doesn’t like his veg – he prefers his peas buttered in a bowl on the side, likes squash roasted rather than mashed and doesn’t love stews. But he still manages to pack in lots of raw vegetables by snacking on carrots, celery, cucumber, tomatoes etc and will always eat something if I say that’s what we’re having. After all, everyone has likes and dislikes don’t they? He’s never developed a taste for spinach, rocket or watercress but I find that if I chiffonade the raw leaves and add a handful to a bowl of soup, he’s happy to eat dark leaves like this. My theory is that if they see you eating and enjoying veg then they will too. Making sure those veg come with some delicious fat is also important. Butter, bacon grease, cream and coconut milk all render vegetables more delicious and more digestible! I’m just about to teach a course on feeding your baby and toddler – I can’t wait to see those eyes when I encourage them to add butter, fry in goose fat and give their little ones liver paté for breakfast! I have two problem eaters in my family, who avoid all vegetables and most fruits. I sneak vegetable and fruit purees into food to improve their nutrition. My son is only nine and is already overweight,so I am us purees to make his food more nutritious and less caloric and encourage him to play outdoors to get exercise. My husband has stage 3 morbid obesity and is pre-diabetic, has asthma, joint pain, and other health issues. He treats the 9 year old as his “eating buddy” and sometimes encourages him to over eat or treats him to high fat fast food. Under these circumstances, I think it would be a mistake not to sneak in veggies and fruit whenever I can. The other family members are normal weight, eat a varied diet, and exercise. We are all working together to model eating sensible portions, eating treats in moderation, and the importance of exercise and activity. I don’t “sneak” vegetables. But I do tend to incorporate them into dishes as much as possible. My kids help in the kitchen, so blending vegetables into sauces or births or tossing them into recipes not typically stuffed with veggies is normal. My kids are all pretty little and very particular about texture. So I don’t have an issue with mincing or pureeing mushrooms, onions, spinach etc. We get the flavor and avoid pickiness. They know it’s in there, I just adapted the food to their preferences. We talk about what they like and don’t like and why. That helps me make meals with vegetables the kids will eat. Favorites are left as main sides. We regularly include ones that are new or not favorites for them to try as taste and preference changes over time. And I also ‘hide’ veggies in food to get the nutrition in, but also for color and flavor. The important part is that the kids help make dinner and they see everything going into the food. I have to say that “sneaking” vegetables has its place. Like I said I can’t stand most veggies straight. Being a college student and trying to cook for myself more I’m starting to puree the ones I can stand (very short list) and add them to things like my chili and recipes to add a much needed nutrition boost. So “sneaking” doesn’t have to be a bad thing. It can be a good way to boost your own vegetable intake while eating foods you like.